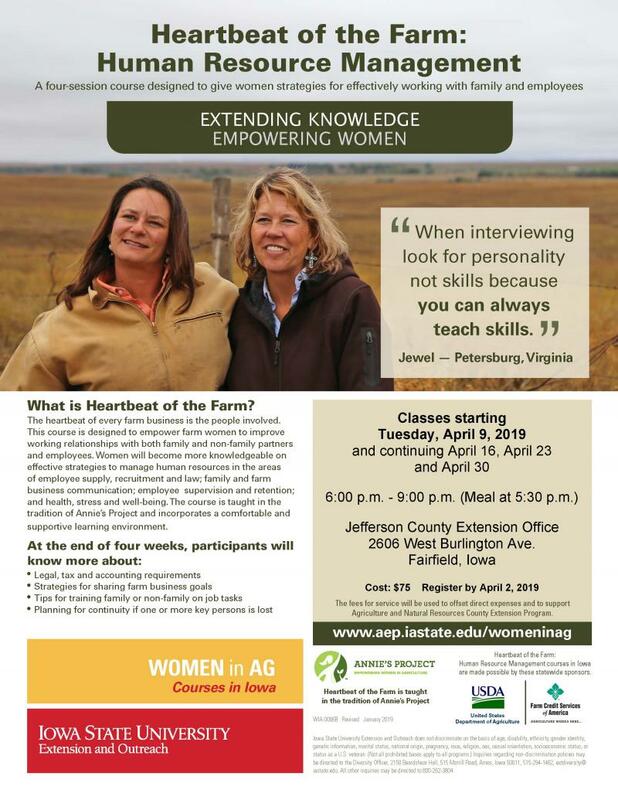 Iowa State University Extension and Outreach Women in Ag program is holding Heartbeat of the Farm: Human Resource Management, a four session course beginning Tuesday, April 9, 2019 in Fairfield, Iowa and continuing April 16, April 23 and April 30. Classes are from 6:00 p.m. to 9:00 p.m. with a light meal served at 5:30 p.m.. The classes will be held at the Jefferson County Extension and Outreach, 2606 West Burlington Ave., Fairfield, Iowa. Cost is $75. The heartbeat of every farm business is the people involved. This course is designed to empower farm women to improve working relationships with both family and non-family partners and employees. Women will become more knowledgeable on effective strategies to manage human resources in the areas of employee supply, recruitment and law; family and farm business communication; employee supervision and retention; and health, stress and well-being. The course is taught in the tradition of Annie’s Project and incorporates a comfortable and supportive learning environment.